I love this!! I’ve never seen one fully fleshed/grown out before, but the idea is brilliant and I’m totally going to look into this. I can see this being perfect for an apartment balcony… I could put flowers and herbs in and get a gorgeous vertical garden that’s functional too. 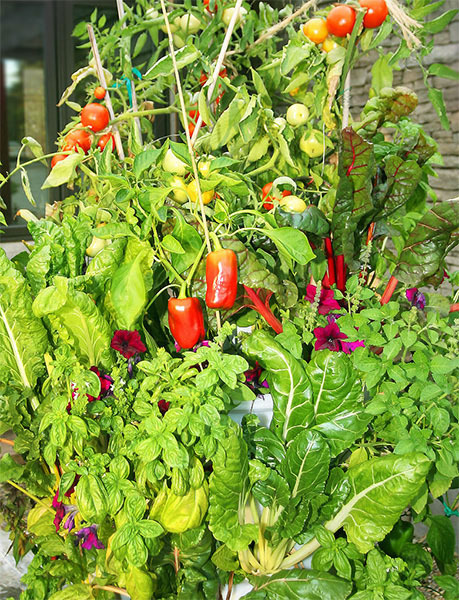 I looked at their website and I LOVE that “design your garden” tool. Great for a few initial ideas. Do you know if it only comes in the terracotta colour? I think I’d prefer black or charcoal colour. Thanks Marlaine, glad you seem to have grasped the concept pretty quickly. As far as I’m aware terracotta is the only colour at the moment. I believe the colour fades a bit after the first couple of uses so shouldn’t be too bright. Any more questions please ask or alternatively take a look at their FAQ,s page. What a great idea. 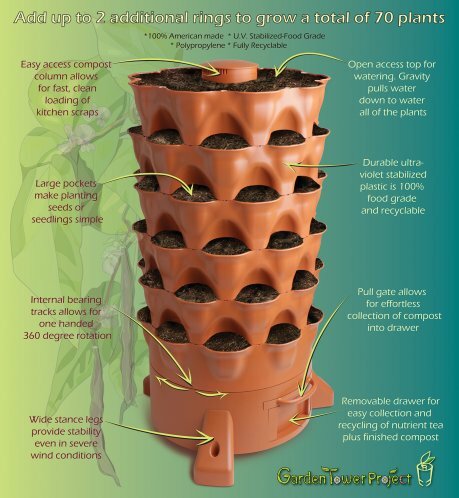 This garden tower would work on any deck or patio area. 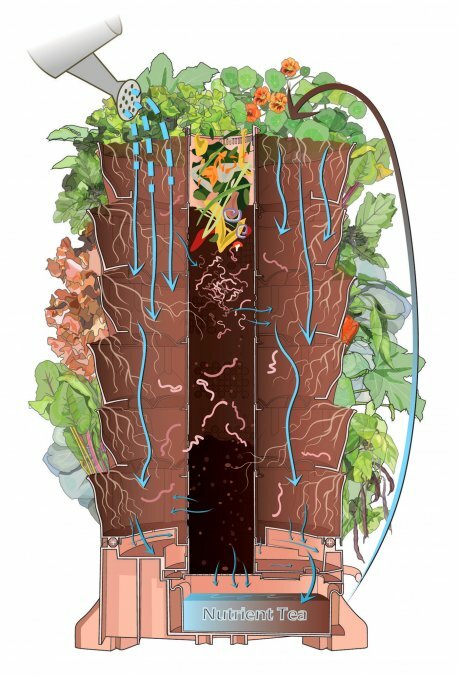 I like the idea of collecting your own compost and “tea” water. I only plant a small garden of tomatoes, peppers and herbs. 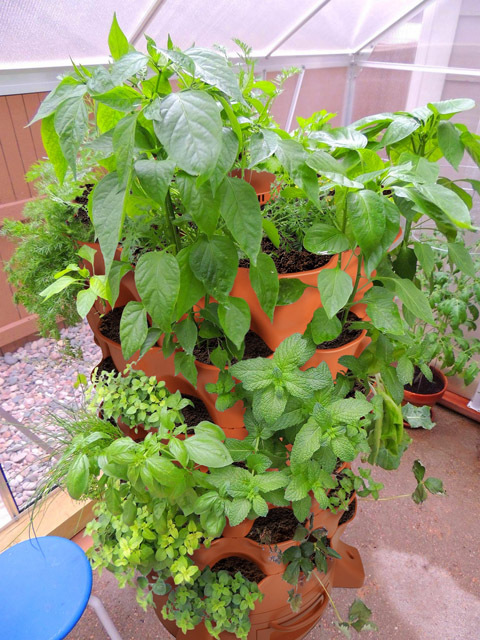 Putting the tomatoes and peppers on top and herbs in all of the side slots will work out great. The fact that it is mobile will let me move it to the available sunlight as the summer draws close to the end. 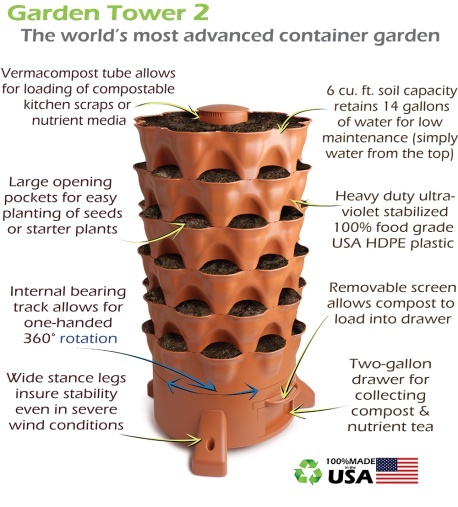 If my tomatoes or peppers get too tall will this make this product hard to move. Thanks John, Talking of moving the tower to get more sunlight — the tower is able to rotate. So if it’s on a patio or balcony where the plants don’t get even light you can rotate it every couple of days. This way the plants get even sunlight. Wow this thing looks amazing. I’ve been wanting to plant a ton of herbs in the house but buying this little greenhouse-type things take up so much room. This seems perfect. I do have a concern with the composting aspect and the smell that can come from it. Do you know if this is an issue? I would hate to have a nice tower of herbs that stinks. Also, are worms included? And can I skip the composting option if I so choose? Hi Nephets, thanks for the comment. You do have a point there. There’s a chance the compost may smell a bit. Yes the worms do need to be bought separately. If you buy on Amazon you can order them at the same time (Link is above). However, if you’re looking to grow herbs indoors I would suggest something from the the Mr Stacky Planters range. This is a bit cheaper and better for insde your house. hope that helps. Hi Matt’s Mom, thanks for the positive comments. Good luck with your move. Florida is a great choice. 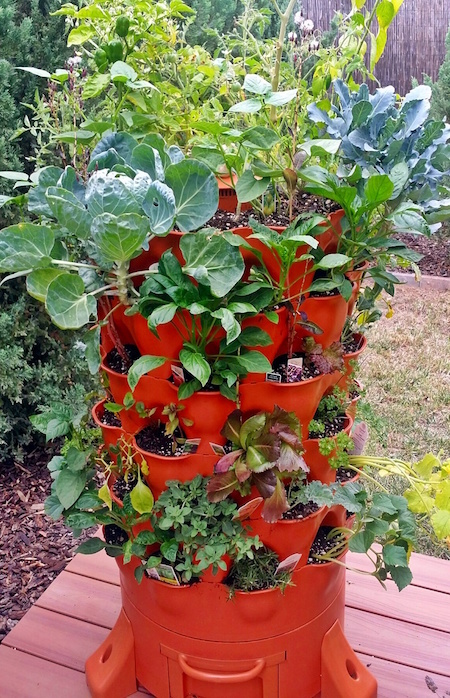 If the Garden Tower 2 is a bit expensive, I recommend the Mr Stacky Planters. You cant grow quite so many plants but their range is a bit cheaper. I think so. Just follow the links on this page. Thanks.